This post may contain compensated links. For more information please read our disclaimer. It was a beautiful and sunny start to the Easter long weekend. The drive from Toronto to Manchester, Vermont was just over 7 hrs long. To break up the journey, we decided to stop at one of New York’s show caves, Howe Caverns in Howes Cave, New York. The cave was a great experience and we were glad we had made the stop. We had never gone boating in a cave before. 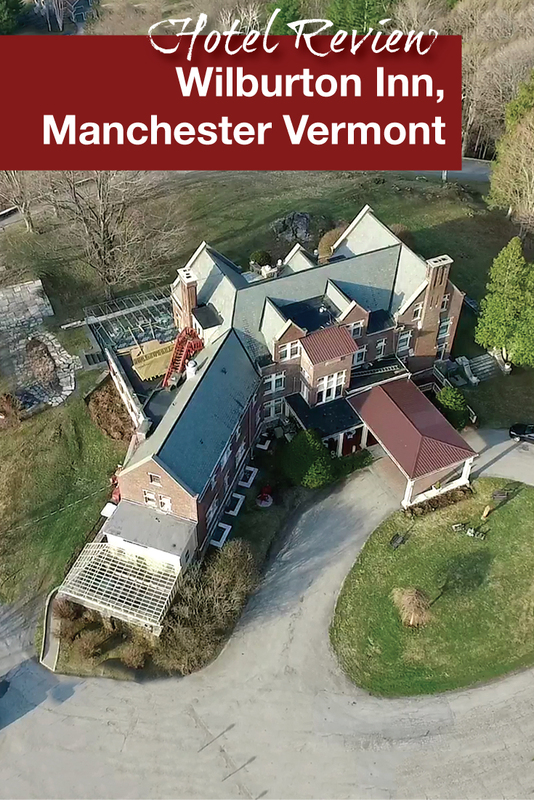 But, we were very excited to get to Manchester so we did not waste any time exploring the town and headed straight to the Wilburton Inn in Manchester Vermont. Make sure to Subscribe to our YouTube channel see all our latest videos! The Wilburton Inn is a mansion within the 30-acre Wilburton Estate. The Wilburton Mansion has 11 bedrooms. Also on the estate are 7 other properties. The smallest is the Innkeeper’s Cottage which sleeps 6. 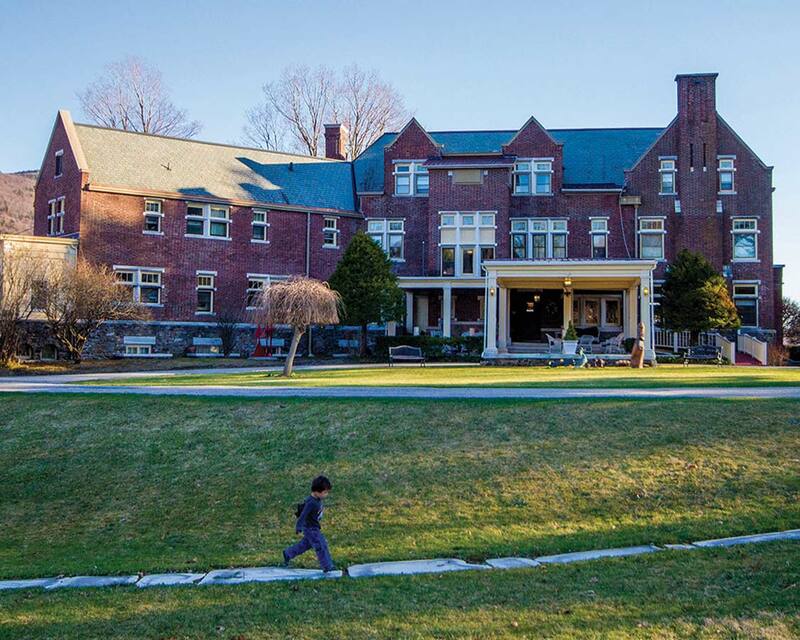 And the largest is the Battenkill Valley Mansion which sleeps 34. The properties are often rented out for retreats, holidays, and family reunions. I was a bit apprehensive at first about staying at Wilburton Inn. It really had nothing to do with the Wilburton Inn but more so about preconceptions I held based on staying at other estates turned inns. Often the mansions contain priceless art and elegant decor- of the type that you would admire by sight but definitely not touch. Our boys are not known for being gentle with things. How would they be able to stay still long enough not to damage anything irreplaceable? But my worries were all for naught. We were greeted with a big smile at the door by Dr. Albert Levis who purchased the inn for his 50th birthday with the vision of turning the grounds into a place where art and science could coexist (more on the Museum of the Creative Process below). As we entered the mansion, Melissa Levis, the primary innkeeper at Wilburton Inn, was there to welcome us. She motioned for us to join her in the sitting room so she could introduce us to the other guests. Between the local treats which she allowed the boys to open and her Cavalier King Charles Spaniel, Jetson, the boys were all smiles about our accommodations for the weekend. Melissa must have felt my apprehension as she told me to relax and let the children be. That’s when I knew that we would have a great family weekend getaway at the Wilburton Inn. We were accompanied to our bedroom on the second floor by one of the staff. The room was very clean with ample space for all our belongings. There was even a walk in closet that doubled as a hideaway for the boys. 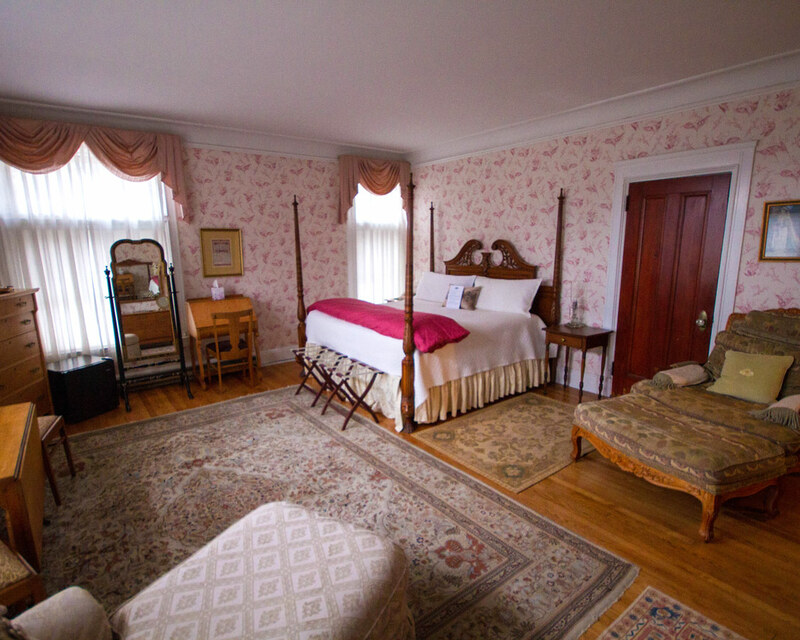 The 2 double beds were luxuriously draped with a very comfortable down duvet. The only downside was I didn’t want to leave my warm and cozy bed in the morning! As we were at the Inn during Easter weekend, the outdoor pool was not yet open. Instead, the boys enjoyed playing basketball and dodgeball. There is also a tennis court on site. This gave Kevin and I time to walk around the grounds and admire the various art installments. Also on the property is the Museum of Creative Process. 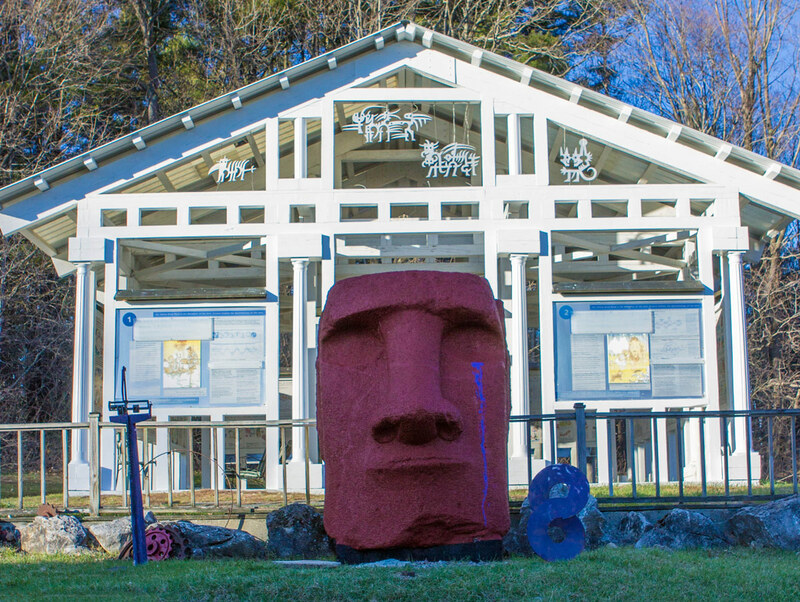 The museum’s focus is Moral Science which was founded by Dr. Albert Levis. This is the premier destination to learn more about how “science completes the mission of religions in the search for peace”. To learn more, check out their very informative website. As we were only at the inn for a couple of days and we wanted to explore Manchester we did not get to take advantage of the on-site spa facilities. 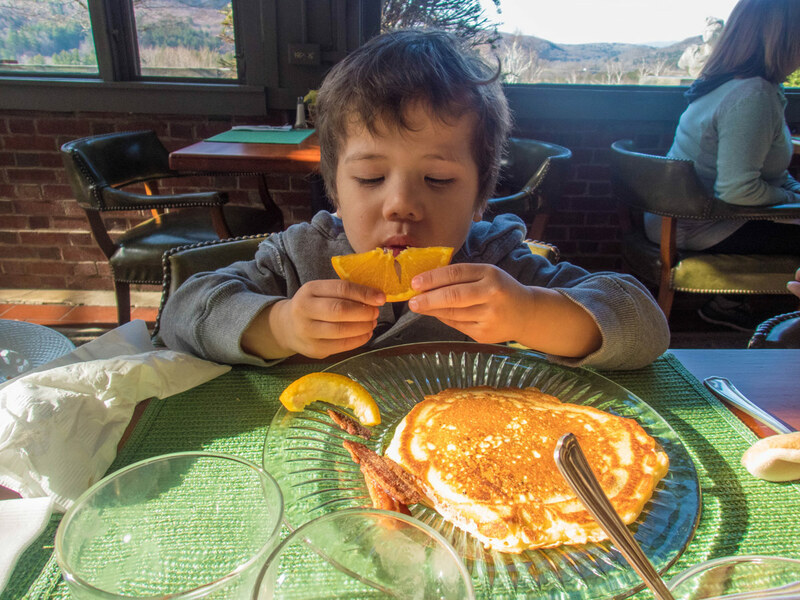 The onsite breakfast served in the dining room and enjoyed in a sun room facing the beautiful Green Mountains was by far the boys’ favorite place at the Wilburton Inn. There is a table with various baked goods and bread made by their very own Earth Sky Time Farm. Also available are fruits and yogurt. Warm breakfast is made to order and items are cooked with locally sourced ingredients when possible. For our first day, Kevin and I both had the omelet and it was stuffed full of delicious vegetables. The boys had chocolate pancakes with Vermont maple syrup. It was a very generous portion that they devoured, but still, couldn’t finish. On the second day, I had the omelet again, while Kevin enjoyed the stuffed french toast (filled with cream cheese and preserves). The boys again ordered the pancakes, but this time they had banana pancakes. One of my favorites about breakfast was that when the boys were finished, they could go into the backyard and play. And due to the large windows, we were able to watch them from the inside. This meant, I could enjoy a second cup of coffee in peace, while it was still hot! Unfortunately, as it was still low season the restaurant was not open for dinners. But, this gave us an opportunity to explore some excellent fare in downtown Manchester. 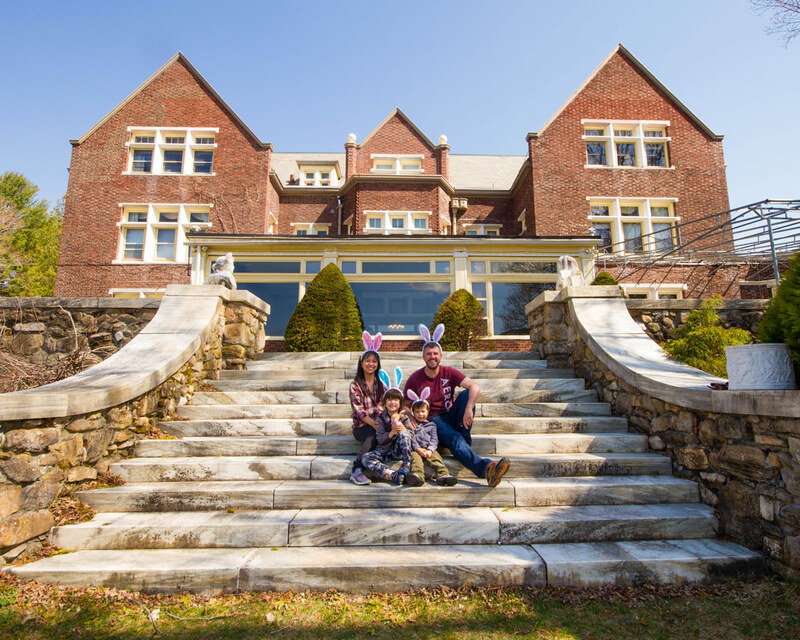 Our stay at the Wilburton Inn with kids was an amazing way to spend Easter weekend. 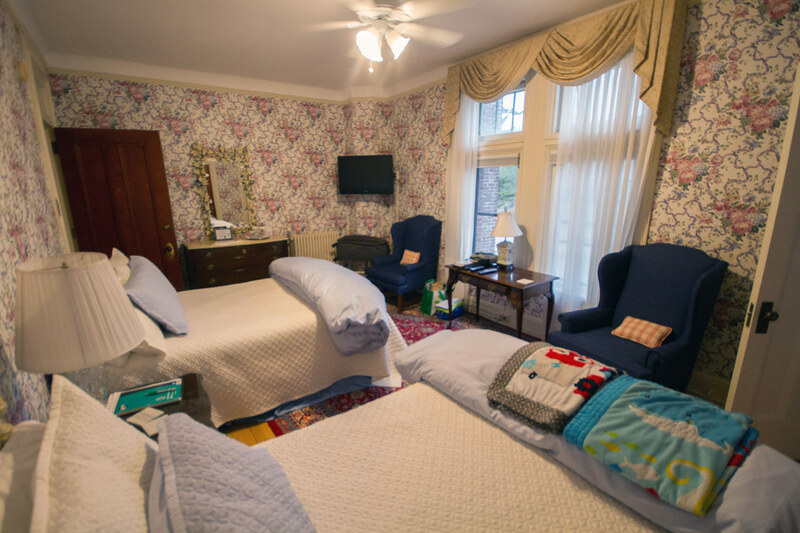 The friendly staff made it feel like we were visiting family instead of being guests at the Inn. The grounds are also a great place for families. 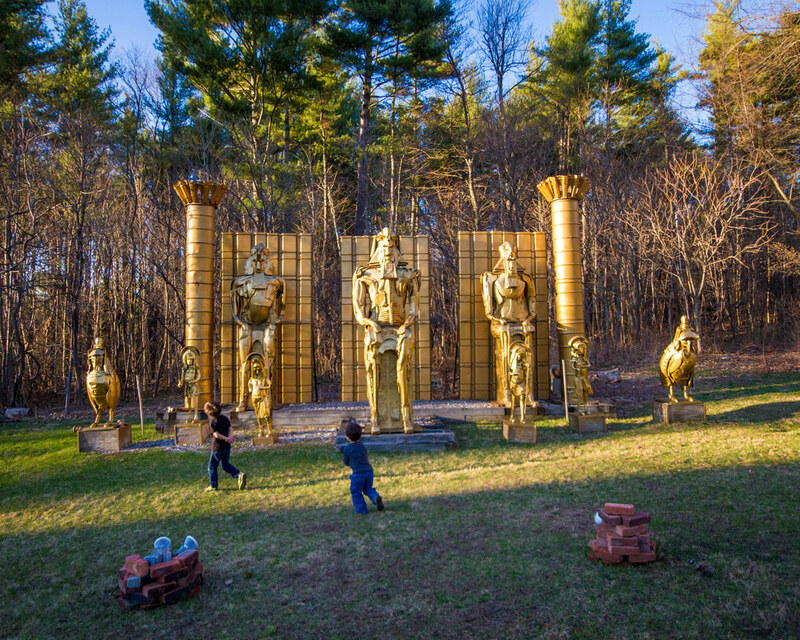 Our kids enjoyed playing dodgeball, basketball, and simply running around and playing tag or hide and seek among the incredible art installations. 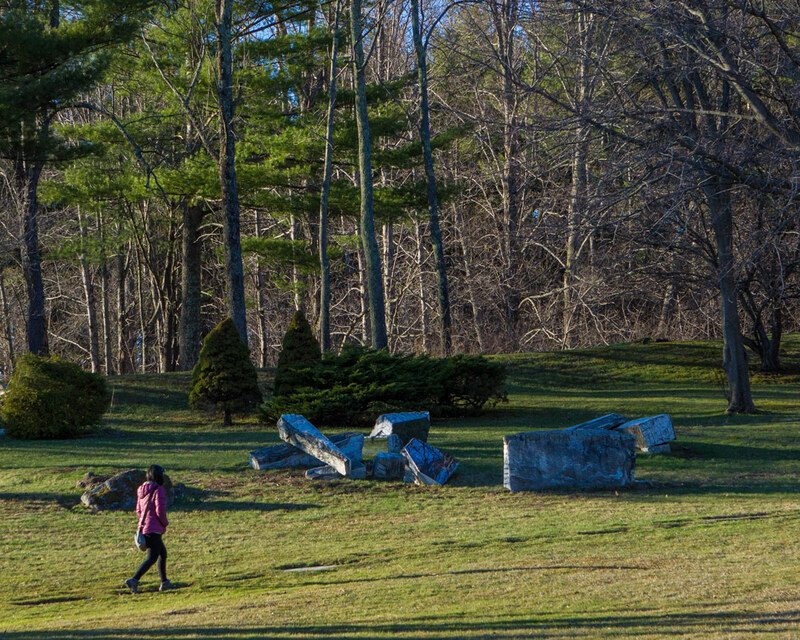 Since the estate extends over 30 acres, there was definitely enough space for them to run around! The Wilburton Inn is also perfectly situated. 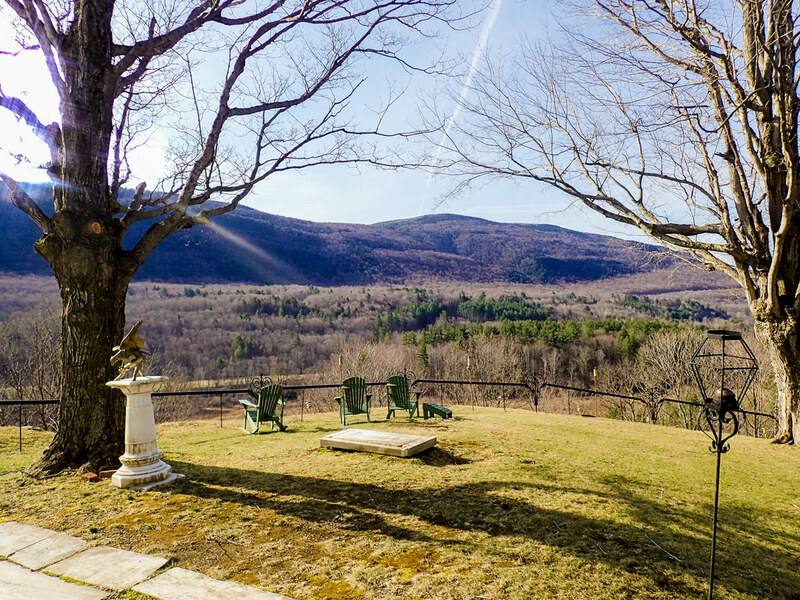 It is not a far drive to downtown Manchester and is less than 12 km (7.3 mi) from one of Manchester’s premier tourist attractions, Hildene, the Lincoln family home. We ended up back in Manchester recently during our Family Camp experience at nearby Mount Snow, Vermont. You can read all about that experience here. Disclosure: We were guests at the Wilburton Inn but as always, all opinions are our own. Wandering Wagars is a participant in the Amazon Services LLC Associates Program, an affiliate advertising program designed to provide a means for sites to earn advertising fees by advertising and linking to amazon.com, amazon.co.uk, amazon.ca. Amazon and the Amazon logo are trademarks of Amazon.com, Inc. or its affiliates. Christina Wagar grew up in a travel loving family. She strives to instil her love of learning about different cultures and seeing new and old places to her husband Kevin and their two young boys. Having experienced over 20 countries across 4 continents Christina is well versed at travel planning and thrives on sharing that information with others with the hopes of encouraging more families to experience this incredible world that we live in. Chocolate pancakes with Vermont maple syrup Christina. Gotta go with the boys on this one 😉 I too would not have been able to finish. Even with my sweet tooth all that richness is a bit overwhelming. This area of the country is gorgeous. Late last year I traveled to northwestern Mass. to pick my wife up at a retreat. A handful of miles from the Vermont border. Vermont is an amazing place which has a lot to offer. I would love to go there one day! I love mansions! What a great stay in a beautiful place. It is also wonderful that this was a kid friendly stay. This looks like a great place to stay. I’ve never been to Vermont, or really explored much of the Northeastern US. I’ll have to keep the Wilburton Inn in mind when I finally make it up there! Looks like a great place to stay with kids. And also very nostalgic with the rustic atmosphere. I have not been on Vermont, but hopefully someday I am on my way over there too. I think it’s so cool that they hard the art pieces on the property. What a unique feature. And of course I’m sure the boys loved playing around the grounds as well. I can’t remember the last time I played dodge ball! Wow, that’s one huge estate! I love the old fashioned cosiness – and any hotel serving pancakes for breakfast is good for me!